Premium Maca vs. Sundried Maca - What Is The Difference? 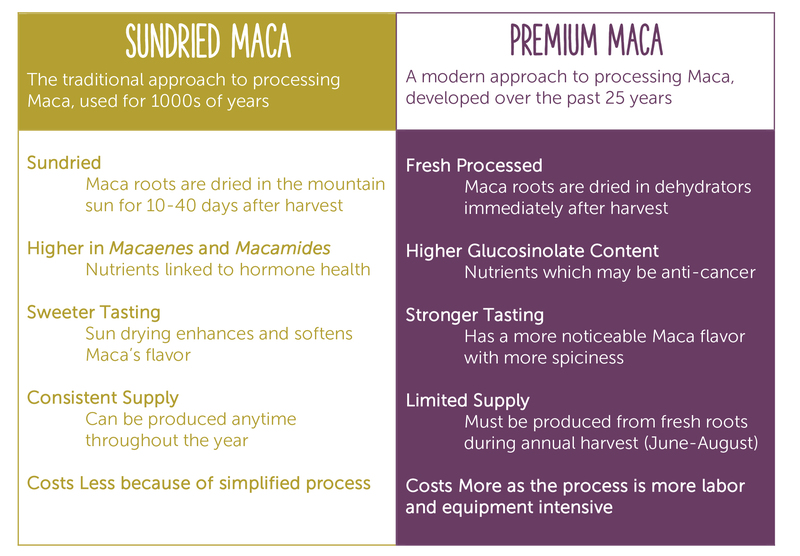 Fresh Maca roots can be processed in 2 different ways for consumption: "Sundried" and "Premium" At The Maca Team we offer both of them in Raw and Gelatinized (pre-cooked) versions. Our Sundried Maca products are made from Maca roots that are dried in the high mountain sun for 10-40 days after harvest. This is the traditional way of processing Maca and makes for a sweeter and softer flavor. It also results in slightly higher levels of "macaenes" and "macamides," nutrients thought to be responsible for Maca's hormone balancing activity. Our Premium Maca products are made from Maca roots that are dried in dehydrators immediately after harvest. This modern approach to processing Maca was developed to help standardize some nutrient levels and maximize glucosinolate (nutrients that may be associated with anti-cancer properties) content. Raw Premium Maca powders have a stronger and spicier flavor. They also cost more because of increased labor and equipment costs to produce them. Which Maca Do I Choose? Our customers report powerful benefits from both the Premium Maca products and the Sundried Maca products. Since all of our products are made from consciously and carefully grown Peruvian Maca roots, you can’t go wrong. We suggesting trying some of each of our Maca products to find your preference.